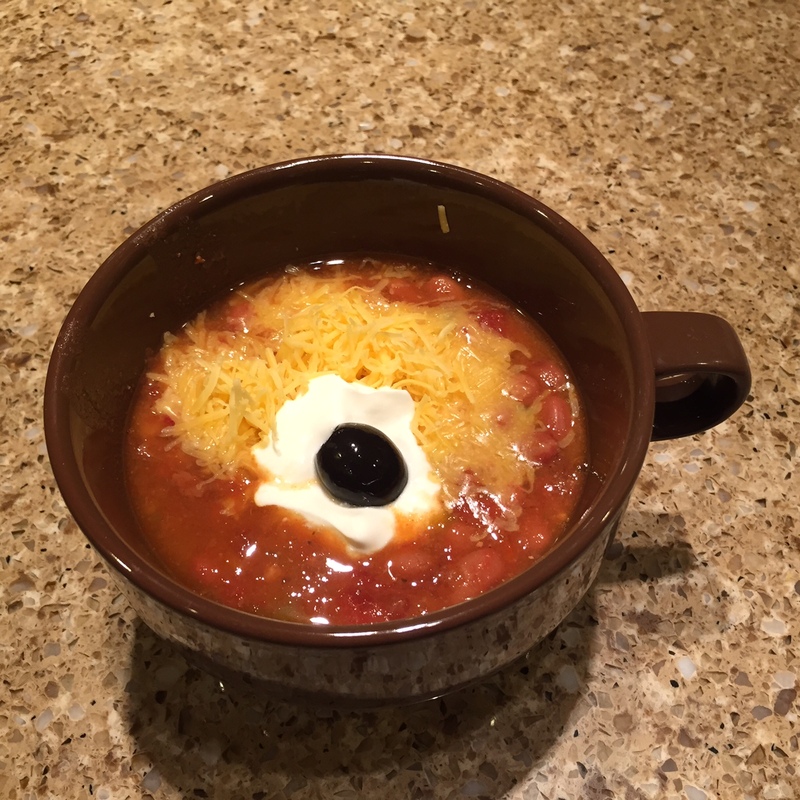 We’ve had a few rainy days this past weekend, and it’s put me in the mood for chili and other comfort food. With my life settling down into a routine, I’m also in the mood to plan menus. When I don’t, I feel like I am flying by the seat of my pants every day, and we also tend to spend more money on groceries. The good news is that we are cooking at home now, as compared to grabbing a bite here and there, as we did during the end of the summer as we fixed up the new house and moved in. My crock pots are unpacked and have already been put into use and I plan to use them a lot this week. Tuesday: Beef stew–made from home-canned beef broth and the small amount of leftover roast, veggies. I will put it into the crock pot early in the day. I work early in the morning for 2 hours, then 4 hours after school, so I need a crock pot meal. Wednesday: chicken wings, rice, green beans: Ja’Ana has some frozen wings she had us pick up, since she likes to make sticky wings on occasion. Saturday: Leftovers. If there are not enough, I’ll pull out a mini tuna casserole I froze when I made it last week. Sunday: I’ll organized that with my sister closer to the day as I have a chance to see what we come up with together. I’m so happy you are able to get back into the normal swing of things. That chili looks delish. Puts me into the mood to make some too. Soup weather here as well. I made corn and crookneck chowder as well as garden tomato soup this week. Made a canner full of tomato juice for the freezer. Also made a gallon of apple cider and used the cooked apples to make apple sauce. We,be been baking the first of the acorn squash..using the leftover squash for muffins. I even made a pumpkin spice candle yesterday. I love how little bits and dabs put together can make such satisfying fall meals. A few years ago I found a southwestern black bean and butternut squash soup that has become an all time favorite. Do you have a special go to fall soup? Glad to read that routines are falling into place..prayers being sent for a job for Rob. God bless! We love chicken-rice soup, vegetable-beef/minestrone, taco soup and chili, and sometimes potato soup (cheesy or not). We also like broccoli soup. When I freeze a lot of broccoli, it’s a wonderful way to use that during the winter. Proud your getting settled in.. Menus sound delicious. Praying for Rob, teaching sounds like an awesome fit! And very happy for your new job! Thanks so much. Now for him to get through this process and GET a job:) He just keeps blitzing them with applications, but they want people they know, and they don’t know him. We’ve been told he will probably have to be in the sub pool for a while first. They say patience is a virtue–we must be getting pretty virtuous by now, I think!! I live in Indiana and getting into the school district here basically works the same way. They hire subs, people that they have gotten to know and that they think would be a good fit within the district. I am a sub in our district. It pays $75 per day. I truly love it. I have been a SAHM for about 14 years. I wanted to work to bring in a little extra money but wanted to be on the same schedule as my children as well. It really has been a great fit for our family. Our district uses a place called Will Sub for hiring, they handle all the hiring of subs and calling them for jobs. They just call your phone and if you can work that day you hit 1. Or you can sign in and see if there is any future jobs available. I doubt that I will try to get into the school for a permanent position. I have heard in talking to other subs that they are desperate for subs and especially for anyone willing to work with special needs kids. Just thought I would throw that out for your hubby, I am praying for him. Your family has been on quite a journey. I just know that God has this wonderful plan for him! Thank you for the encouragement. Everyone from an administrator during an interview to the HR department have been really encouraging to him to just keep sticking it out and in time, he will get hired. So, we are trusting that it will work that way, or that God will show us very clearly that He wants Rob to go in another direction. He did get another interview for Thursday, so…….that’s encouraging, too. At least he’s making it to the top of the pile (which in once case, at least, had 40 applicants) for the 7th time:) I know they don’t interview 40 people, so I know they are interested anyway. I agree the biggest issue is that he has never done any work of any kind for the school district, so they don’t know him. Becky, I left a message for you on Erika’s “Make Do” website. I tried your recipe for pesto today and it was wonderful! No, I had never eaten it before (food allergies, VERY STRICT DIET) and I loved it. I’m glad you like it. It’s sure simple, very inexpensive, and Ja’Ana and I love it! I have been searching for more recipes on the internet and want to try more. If you ever find your recipe books, do post the best. This afternoon I plan on trying another one with peppers. I am in a hurry because it is past time for the weather here to turn off cold. That will end my basil plant. OK. Some of my cookbooks have turned up. BUT, I have a bunch of binders full of recipes I have printed from the internet that I haven’t found yet. I’ll let you know when I do. Good luck with the pepper recipe. Sounds like you are really settling in well. I also cooked extra this week. Started with a roast from the freezer. Soaked and cooked a pressure cooker of beans in the leftover beef broth and a hand full of home dried onions. Used some of the beef and beans to make burritos. Every day there is a pressure canner full of apples cooked for juice and applesauce. Filling the empty places in the freezer. Our cooler weather has encouraged the zucchini and tomatoes to set on new fruit. God is so good to provide us with such abundance! That is wonderful! We had a nice day today, but it’s supposed to get cloudy and then rainy. Hopefully, my little lettuce can grow, grow, grow while it has a chance. I’ve never really tried to do much with winter gardening, so it’s an experiment!